Ed was born at his parent’s Ike and Edna’s (Schneider) homestead in the Upper Hat Creek Valley. Ed was the oldest of three children Steve (Jean) Carol (Mark) and Uncle to numerous nieces and nephews. Ed was a very curious, ambitious, determined and practical young child. As early as age 5, Ed’s curiosity about how things worked, ran and were built, began his lifelong career in mechanical (ingenuity) engineering. Ed’s fierce independent spirit didn’t lend well to the formal education system. Ed had his own plans on how he would educate himself. Ed was an avid reader and a mathematical genius. Ed’s parents were pioneer ranchers in the valley and had a long-standing history in the Ashcroft area, dating back to the late 1800’s. Ed was very proud of his family’s history, Mount Lehman named after his great grandfather held a special place in his heart. Ed always enjoyed visiting the Ashcroft museum where his family’s history is so beautifully documented. Ed being a vehicle enthusiast was surprised by his loving family at his 50th wedding anniversary to ride in his great grandfather’s original car, a 1911 McLaughlin Buick, a gift of love and respect for family and history. Ed with his parents and brother moved to Pavilion, BC in 1947. Later, Ed’s father Ike managed the Diamond S Ranch. This is where Ed was introduced to the love of his life, Verna Lorraine Anderson. Verna’s family had moved up from Lulu Island (Richmond) in 1949. Verna’s father, Elmer, heard of a ranch hand position at the Diamond S. Ed was busy honing his mechanical skills at the Diamond S Ranch fixing equipment for his Dad. Ed met Verna’s father, Elmer and instantly became friends. 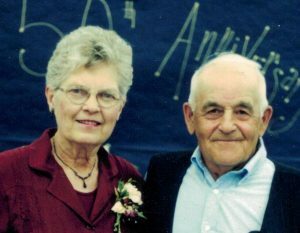 Elmer saw potential for a relationship as Ed and Verna were only 19 days apart in age. Of course, Verna played hard to get, she had dreams of attending post-secondary school in the area. With his handsome, easy going, fun loving nature, along with Verna’s Mom, Agnes and both Verna’s brothers Lloyd and Richard’s love for him, Ed became irresistible for Verna. The beautiful courtship began. There are so many marvelous pictures of this event most taken alongside of Ed’s cars they looked like a Hollywood couple posing for the latest cover of Vogue. The blend of Ed’s masculinity mixed with Verna’s femininity was a match made in heaven and oh what a beautiful life they created. Ed and Verna married in September 26 1953. They had a short move to Quesnel where Dad gained employment in a local sawmill. 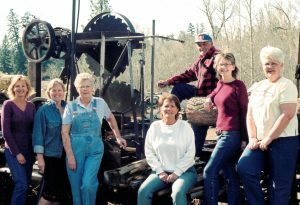 Dad began the construction of his family`s home using his mill. Times were hard, money was tight, but love and family were abundant. Ed and Verna had six children: Sharon (Jim), Gloria (Steve), Barbara Ann (Paul), Gordon (Died as an infant 1959), Donna (Brad), Helen (Darrell), 8 grand-children Raymond, Jimmy, Richard, Heather, Charlotte, Joel, Jared and Kenny. 4 Great grand-children Alexis, Emma, Sam and Lewis. Dad loved the abundance of his family, he jokingly referred to extended family as his “spares”. The home literally was built around the kitchen, the heart of this family. In many family photos, Dad is seen beaming with pride as his family gathered around him. Dad had an incredible wit and famous one-liners which brought his family joy and laughter throughout the years. As the years went on Dad became a BC Forestry Fire Warden using his hand-built heavy-duty equipment on many local forest fires. 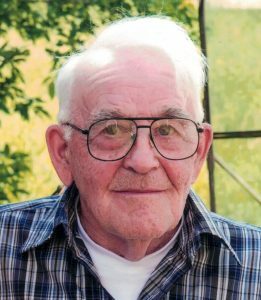 In the late 1970s, Dad worked with BC Hydro Hat Creek Coal Project, specifically D.W. Coates Drilling building drill site roads, core sheds, set up of camp and drill sites, and serving as a general fix anything guy. Dad’s driveway and phone line soon turned into a steady stream of, `Eddie, can you fix this`, `Eddie can you help with that`. Yet Dad still found the time to build go-carts for his grand-children, fix family cars, plow snow banks so his family could enjoy a fun sleigh ride. He made family skating rinks and swimming pools, built swing sets and even converted an old school bus into a camper. Dad provided abundant love for his family that we are forever blessed. Dad retired in the mid-80’s and at that time built a gargantuan garden! Reading and honing his organic-focused gardening skills, he built a heated green-house by designing his own wood heating system. Dad’s love of wholesome produce taught his family to never settle for store bought. It was a yearly family affair, fall garden harvests. In retirement, Dad also built a car modeled after a 1932 Chev. Most people would think Dad bought a kit but that wasn`t his style. He built it from scratch piece by piece just like he had done with so many other projects in his life. This was what his grandsons` would call his swan song. It’s a beautiful rendition, Ed’s projects in the past were based on practicality not necessarily ascetics but not this time. Ed and Verna left their Hat Creek homestead in April 2012 and moved to Kamloops. It was an act of love for Mom as she needed to be closer to family in their more senior years. Dad lost his brother Steve and sister-in-law, Jean in 2014. Dad’s health deteriorated and in January 4, 2017 Dad was admitted to Royal Inland Hospital with pneumonia and Alzheimer’s symptoms. 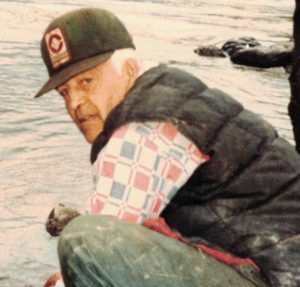 He was later placed in care at Ponderosa Lodge in Kamloops. As always family gathered regularly at Dad’s side we enjoyed many joyous visits and celebrations. Dad’s wit and calm demeanor provided the staff at Ponderosa many beautiful memories, which we as his family hold dear and are truly thankful for. Dad passed peacefully in his sleep in the morning of January 4, 2018. So sorry to hear of his passing. I always enjoyed his company and working with him on the Diamond S when he came to help. Our thoughts are with the family. Ed was a great friend and neighbor when we lived at Hat Creek. He fixed a few things for us too. What a great man. What a lovely passage to read! I’m so sorry for all of your losses. What a beautiful life! You have so many special and happy memories of “Dad”, thanks for sharing them. You spoke so highly of him and were always there for him and mom. Our love and hugs to all of you Donna & Brad, Helen & Darryl and the rest of the family. The life provided to you all is a life cherished by a abundance of memories that will never leave your hearts! Our thoughts go out to you all! So sorry for the family, my heart is with you all. Loving thoughts and prayers from Aunty Donna and all the family. I have so many fond memories of our get togethers at Hat Creek that I will always cherish. My heart goes out to you, Verna & Family! One of the greatest men I every got to know. He taught me so much and for ever thankful. Rest In peace dad you earned it! Gone but he will always be with you in spirit and in your special memories. Condolences to your family. So sorry to hear of Ed’s passing, my condolences to the family. I will miss Ed’s visits to the museum and hearing his stories. A true Ashcroft pioneer! What a beautiful tribute to Ed. He was a special man and will be warmly remembered by many, including me. I can still see his ready smile. Our condolences to Verna and family. Sorry to hear just now of Ed’s passing…..a friend and the wizard of the Valley down to Pavilion Lake…there wasn’t anything Ed could not fix or build…Linda and I loved going up to house at Hat Creek where we would sample Verna’s cooking and I would catch up with Ed’s new projects …..the one that comes to mind was his co-gen greenhouse it is unreal to beleive that you could grow tomatoes in winter at Hat Creek, of course I have to mention the automoblie that he built totally by himself, or the bush mill. It was always a pleasure visiting Verna and Ed or when Ed would do one of his rare visit to the Lake and drop in to see what was new at the Lake. Gone but never forgotten a true pioneer in our time.